You probably guessed it but I love to work. I love to make things and create products to share with others that they can then too make. When I was a kid, I was the one doing the making of the products that were out there for sale. 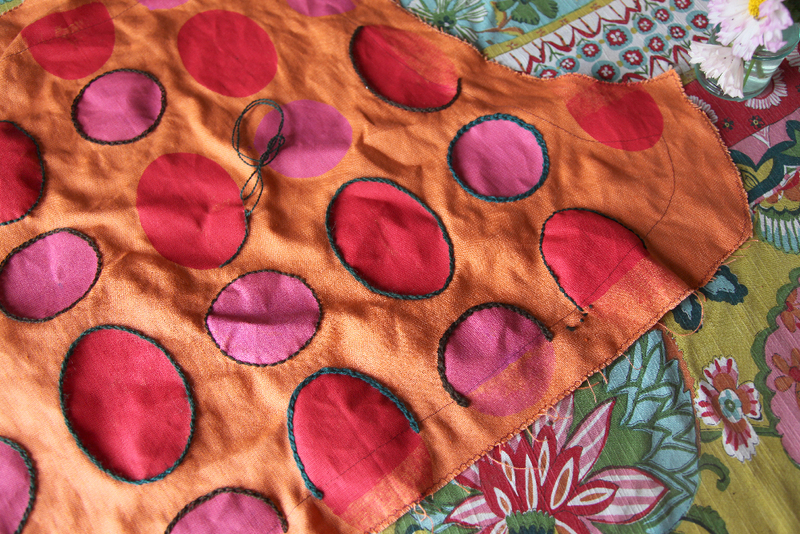 I spent all summer sewing and stitching - it was heaven. Now it is the other way around - me designing the products for others to make. There hasn't been much producing around here the past couple weeks. Julia and I have been out and about - visiting friends and relatives. Sure, I have worked a bit on my Chair Project but I can't say I have gotten very far or inspired. Julia goes back to school soon and she is excited about the new prospects of her coming junior year. I'm looking forward to her getting back and me getting back to work too. I've been craving work the past couple days but I am so distracted that I cannot get any designing or art done. I need my own time and space to create. Soon. It is happening soon. This past week, Julia and I have been taking advantage of some of the fantastic places to visit around here. 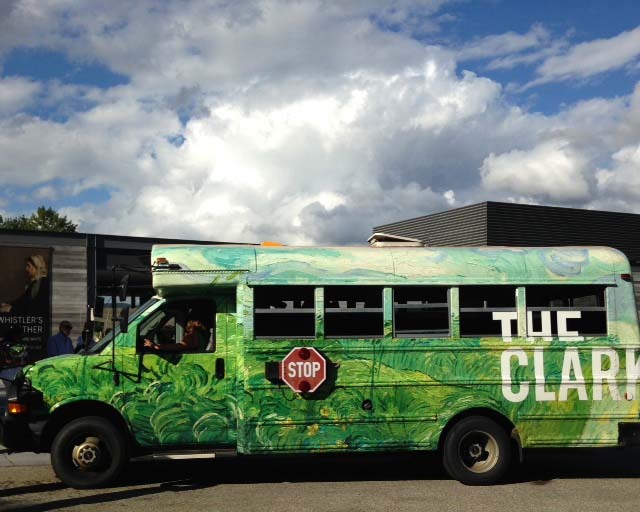 On Thursday, we went to The Clark Art Institute in Williamstown, MA. There is a show called Van Gogh and Nature. If you are anywhere in driving distance to The Clark, GO. The show is there until September 13th. The catalog is available here although I did not purchase it. Surprisingly, Julia enjoyed the exhibit too. We were there late in the day (hint: a guard told me it is always slow late in the day, so go then if you like to avoid crowds), and had lots of time to look around. Like any teenager, she was curious about Van Gogh's ear. And she was trying to figure out (as I was) how the heck he painted so many paintings in a year. I suppose it helped he didn't have a family to cook for and a house and farm to care for. I have read this bio on Van Gogh and maybe I should read it again. I asked Julia to chose her favorite painting in the exhibit. She chose this one which is from Paris' Musee D'Orsay. 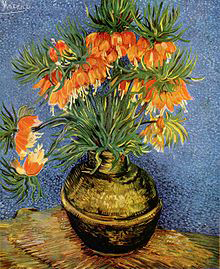 It is called Frittilaries in a Copper Vase. 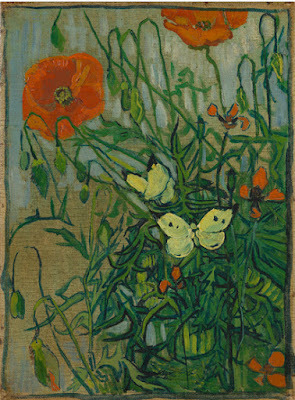 The very cool thing was that next to the painting was the actual vase that Van Gogh painted. It looked brass to me. If you enjoy art or color or nature - or all three - and you live close enough to get to The Clark - GO to see this exhibit before September 13th. I think it may be the art highlight of my summer. 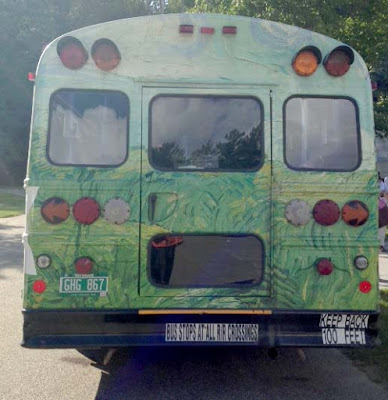 If you go, you might be able to take a ride on the Van Gogh bus! BTW, if Julia is really interested in knowing more, try to find a copy of the Documentary stuff that LEONARD NIMOY did on him years ago. PBS might've produced it..? As I recall, a lot of the info came by way of Vincent's brother THEO. As for the paint thickness... I think he might have made his own..? The oils used then are different from modern ones. I don't know for certain, but the paint then might have contained much more lead. - [Exposure to which, might also explain some of his health issues!] - That I think would thicken it up, wouldn't it? When you paint, do you add in much linseed oil? Anyhoo, I'm glad you two got to see the Exhibit. "COLOUR" is what that whole IMPRESSIONIST PERIOD was all about. - Personally, I'm a big fan of GAUGUIN's Polynesian works. [Got several prints on my bedroom wall.] Whilst in Europe his tones were rather dull, but the Tahitian stuff has a much more vibrant aesthetic. Also, if Julia is getting into this style of art, you'll have to take her to Chicago "some" day to see GEORGES SEURAT's "A Sunday on La Grande Jatte" at the Art Institute. Worth the trip! And, you can get close up to see the brush strokes, or in his case, "dots", too! I was lucky enough to see this exhibit earlier in the summer--it was incredible! Did you see Whistler's Mother too? The contrast between all the greys of Whistler's work and all the color of Van Gogh's was really interesting. Thanks so much for sharing the exhibit. It looks wonderful. It's such a thrill to see painters like Van Gogh or Monet. I hope you find out the trick to the thick paint. It is a wonderful technique. Van Gogh has always been a favorite of mine, as well. He used a technique known as Impasto (https://en.wikipedia.org/wiki/Impasto), try using a palatte knife (or several of different sizes) to paint with instead. I'm glad Julia is looking forward to her junior year. I LOVED my junior year!! Julia, enjoy yourself, explore, and just have a good time. You have a lot of fans out here!